Peter Allard discovered this summer-plumaged GREAT KNOT at Breydon Water (Norfolk) late on Sunday evening whilst carrying out his regular wader counts but not really believing himself, reluctantly put the news out just before midnight. A small gathering of birders arrived at 0500 hours this morning and relocated the bird in the same area, about a mile downstream of Burgh Castle. As the tide encroached, the bird, along with the other waders on the estuary, were eventually forced down to the east end, with it roosting on the marsh in front of the hide from around 0950 hours. 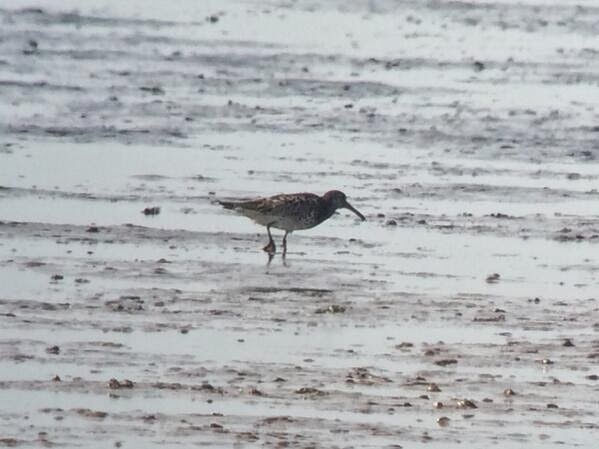 It reappeared on the mud at 1420, initially feeding on the north side of the Bure before relocating to the south side about half an hour later. It then showed distantly until late evening, delighting at least 400 successful twitchers. It represents only the fourth record for Britain.